This charming tiny bamboo boat carries two hand painted passengers, and has several other details including an oar, a table, and an overhead awning that sports two pink plastic pearls dangling from pink glossy string. The boat has a bit of red twine that stretches across the top of the awning and ties at both ends. The bottom of the boat has a mat of woven reeds. The boat base is made of two pieces of bamboo that still bears a golden sticker with the words "Made in Taiwan, Republic of China". This little boat is appx 7 inches long, 3 inches tall and 2 inches deep. It weighs 0.8 ounces. This tiny Oriental Bamboo Boat is at least 30 years old and in good condition. "The Carpenter's Shop" in Flat Springs, New York. It has never been used and still has it's original tags attached. The napkin hold is 5.5 inches wide, 5 inches tall, and 2.5 inches deep. It weighs 8.5 ounces. 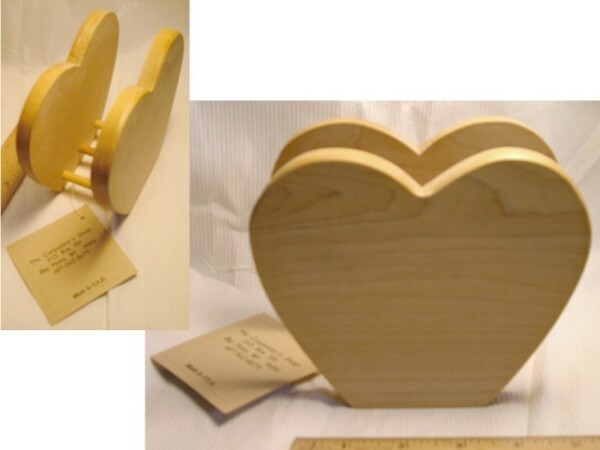 This heart-shaped Maplewood Napkin Holder is at least 30 years old, and in good condition.